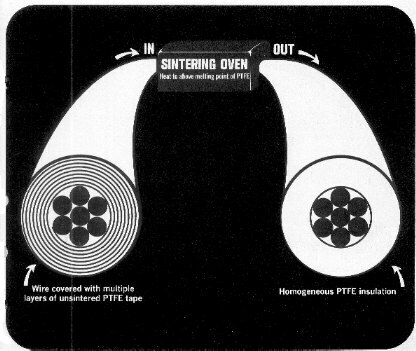 Similar to the special advantages that Tape-Wrapping-Sintering (TWS) method provides for the PTFE Sleeves/Tubings (click here for details), we give below several ways in which TWS method helps manufacture PTFE insulated wires of HIGHER RELIABILITY. The multiple-layer construction of DRUFLON-TWS ensures high dielectric quality of the insulation. Any flaw is limited to a single layer of the tape. Contamination flaws in the PTFE are minimized by manufacturing our own tape in a clean-room facility. The wrapping process places the insulation concentrically around the conductor and does not force it into the interstices between the conductor strands. Proper curing of insulation under high temperature is also regularly checked by a sample check of Break Down Voltage (BDV) on each new lot. Over the years, these BDV's have shown progressive increase, indicating steady improvement in the processing of wires. The thinnest section of insulation is what determines reliability against abrasion, cut-through or dielectric failure. DRUFLON-TWS is insulated by multiple layers of PTFE fused into a homogeneous insulation. The conductor is always in the centre of the insulation. Mechanical strippers index from the outside of the insulation and will therefore nick the conductor if it is too much off-center. How to Check Concentricity - Remove the conductor from some length of wire. This will leave the insulation in the form of sleeve/tube. Pour some molten wax in the sleeve and lay the insulation on a wooden block. Place a razor blade against the middle section of the insulation and strike the blade sharply with a mallet. A sharp blade will slice the insulation through with no distortion. Wall thickness of the insulation can be measured with a microscope. 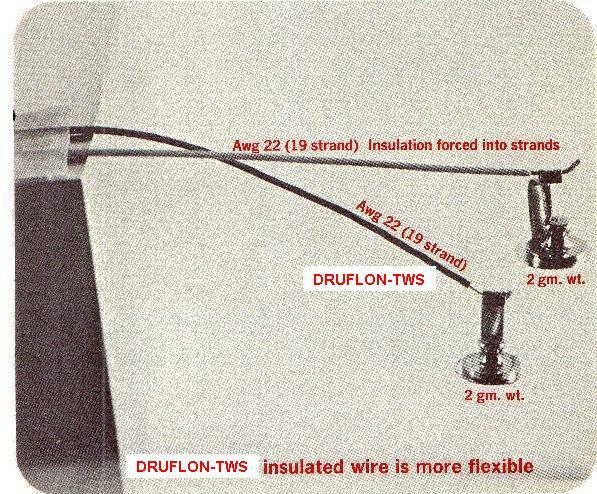 DRUFLON-TWS insulation is not extruded into the interstices of the wire strands. Therefore, the insulation can be easily stripped off the conductor without disturbing the lay of the stranded wire. This helps in easy and faster terminations. 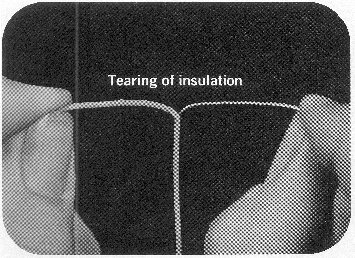 The accompanying picture shows the difference when the same weight is hung on two wires having the same conductor and insulation thickness. 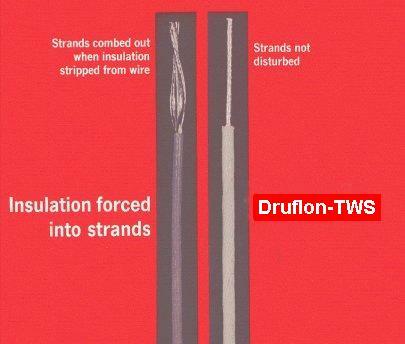 DRUFLON-TWS insulation is not forced into the strands and, therefore, does not inhibit the free flexing of the outer strands of the conductor and the full flexibility of fine stranded wire is preserved. The figure below is also helpful in understanding the difference between flexibility and flex-life, which is commonly misunderstood. Flex-life refers to the useful life of wire (or cable) under repeated flexing under specified conditions. 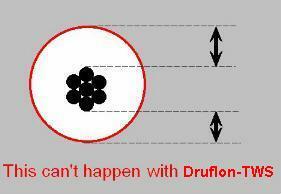 The molecular structure of DRUFLON-TWS PTFE is oriented biaxially, hence propagation of tears is difficult. Uniaxial orientation makes it easy to tear the insulation along the axis of the wire. Availability of many colours in moderate quantities is a definite plus point of DRUFLON-TWS wires; extruded constructions often require large minimum orders for many colours. It is important to note that DuPont uses Teflon ® trade name for a number of different thermo-plastics with varying properties. For example, FEP Teflon is melt-processable unlike PTFE, is not so good for high-frequency applications, has a limitation of 200°C for maximum operating temperature as against 260°C for PTFE Teflon, and is considerably more expensive than PTFE. When comparing extruded constructions with tape-wrapped ones, the above facts need to be kept in mind. It is best to compare extruded PTFE with tape-wrapped PTFE, and in this comparison, extruded PTFE generally encounters problems like ring-cracks and axial splits, in addition to the ones mentioned above.